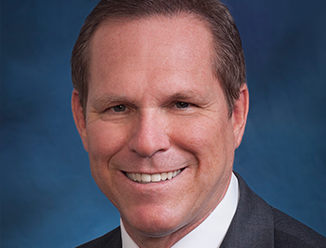 Jeff Moore is a 30-year veteran of CBRE with leadership responsibilities for both the Orange County, California region, as well as for Retail Services for all Southern California offices. As a Senior Managing Director for the Orange County Region, a role he assumed in 2007, Jeff is responsible overseeing operations, business development and client relations for all lines of business in the Newport Beach and Orange Central offices, which total over 360 people including 110 sales and leasing professionals in addition to the Property Management, Project Management, Valuation & Appraisal and Debt & Structured Finance groups. Under Jeff’s leadership, CBRE has maintained its long-time standing as the market leader in Orange County year after year. In 2016, the Orange County Region completed more than $7.6 billion in sale and lease transaction value, and is the leading commercial real estate services firm in Orange County in terms of revenue and marketshare. In September 2009, Jeff, who spent much of his commercial real estate career building one of the top producing retail teams in the country, also added responsibility for Retail Services for all Southern California offices. In this role, he is responsible for deploying CBRE’s platform of services to provide overall strategy and consultative real estate solutions for the firm’s retail clients. He also works closely with the business line leaders of Asset Services, Brokerage, Investment Properties/Capital Markets and Valuation & Appraisal to create client specific, integrated retail teams. Jeff’s initial transition from brokerage to management came in 2006 when he took on the role of Managing Director for the Anaheim office. The next year, he was promoted to Senior Managing Director for the Inland Empire Region, considered one of the fastest growing markets in the country at the time. During his leadership tenure, he successfully led the Inland Empire Region to new heights, growing the business by 20-25 percent annually. As a retail broker, Jeff consistently ranked among the Company’s best performing retail professionals nationally, specializing in tenant representation and shopping center development. He is a graduate of CBRE’s first Emerging Leaders Program, which identifies and develops future market and line of business leadership in the United States.